Chuy Bubble Gum Scent truly does smell like bubble gum. Try it for yourself! Chuy Bubble Gum scent is our ode to all things delicious and fun! As a kid, was there anything better in then opening up a piece or in a lot of cases a pack of gum, chewing it up and blowing the biggest bubble you could? Did you ride your bike to the store to get it or did you get your bubble gum from the ice cream man? Whether you were a fan of Bazooka or Double Bubble or any of the big brands like Bubblicious, HubbaBubba or Big League Chew, this scent will truly take you back to your childhood. Relive the happiness of your youth everyday with Chuy Bubble Gum! Chuy Bubble Gum Scent truly does smell like bubble gum. In a blind smell test, 10 of 10 people all easily recognized the smell as being gum! Don’t believe it - try it for yourself! Scratch the logo to smell the scent through your screen. 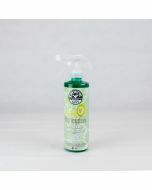 The Chuy Bubble Gum Premium Air Freshener & Odor Eliminator is a concentrated long lasting premium air freshener with natural enzymatic odor elimination properties to eliminate odor and reduce recurring odor. Use sparingly or dilute accordingly for superior air scents, and long lasting deodorizing ability. The scent bottled within may cause flashbacks to your early childhood...you just blew the biggest bubble you could, what at the time was a great idea, however you forgot that when it pops its going to stick all over you face and maybe a little bit in your hair.